The ever famous Korean beef stew is obviously a Korean dish but Filipinos also loved this dish. I’ve heard this is a popular dish served in House of Kimchi. I’m not very fond of Korean dish but this one is an exception. This beef stew recipe I have here is not very spicy unlike the original Korean beef stew but I’m sure you are going to like it. There is an option if you really want to speed up your cooking. Buy a Mc Cormick Korean beef stew mix but it might not as tasty as the well prepared dish. Heat oil in a deep skillet and saute garlic until brown and toasted. Remove garlic from pan and set aside. In the same pan, saute onion until wilted then add the beef and stir fry until brown. Pour the soy sauce and beef stock just enough to cover the beef. If you will use water instead of beef stock, add beef bouillon cube. Add in the star anise and sugar and bring to a boil for an hour or until beef is very tender. In the meantime, heat an empty skillet and toast the sesame seeds until slightly brown. Mix with a spatula while toasting so it will be even, just prevent it from burning and turning it like black peppercorns. Add the toasted sesame seeds, spring onions, toasted garlic, sesame oil, green chilies and simmer for additional 5 minutes. The ever famous Korean beef stew is obviously a Korean dish but Filipinos also loved this dish. I've heard this is a popular dish served in House of Kimchi. Heat oil in a deep skillet and saute garlic until brown and toasted. Remove garlic from pan and set aside. In the same pan, saute onion until wilted then add the beef and stir fry until brown. Pour the soy sauce and beef stock just enough to cover the beef. If you will use water instead of beef stock, add beef bouillon cube. Add in the star anise and sugar and bring to a boil for an hour or until beef is very tender. In the meantime, heat an empty skillet and toast the sesame seeds until slightly brown. Mix with a spatula while toasting so it will be even, just prevent it from burning and turning it like black peppercorns. Add the toasted sesame seeds, spring onions, toasted garlic, sesame oil, green chilies and simmer for additional 5 minutes. Season with patis and black pepper and adjust the taste according to your taste buds. Serve hot. What kind of a fool puts rotten fish sauce on beef? Most Asian and SouthEast Asian cuisines use fermented fish sauce. Fish sauce is like MSG that gives more flavor to dishes than using plain salt. Also, let me add some more info, there is a fermented fish sauce called “bagoong isda” usually colored brownish gray composed of fermented fish, salt and water. The fermented fish sauce I was referring to on most of the recipes here is “patis”, usually colored crystal brown and the fish is filtered. Only the fish essence, water and salt composed the “patis”. I was craving for a Kimchi (a fastfood chain’s name) version of beef stew this morning since its my favorite. However, instead of going to the store to order a take out, i tried cooking it myself using the recipe here with a few modifications due to some missing ingredients. Eureka! This worked for me. Tastes like the one I always order. And Rob, the fish sauce worked like a charm. Just season it according to your taste. Me, I just added a tablespoon of it. Also, I used cured beef (tapa), which greatly improved the taste. Well, that’s because its all I can pull out in the freezer too. Instead of Beef, Can the same recipe be used in same amount of pork and or chicken? or do I have to adjust all the ingredients? do you have any suggestions? I don’t see any problem regarding the amount of pork or chicken you will use. If the recipe says one kilo of beef, I think the same amount can be used in chicken or pork. What I’m not sure is the taste. 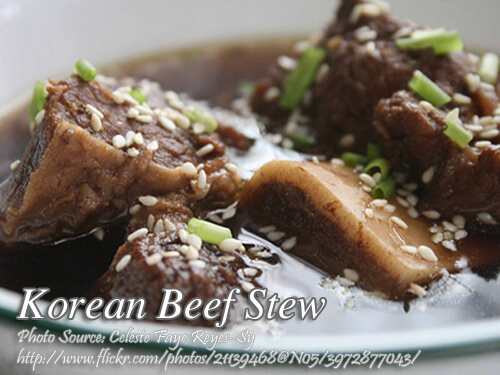 Beef is the best for cooking Korean beef stew. What will i do with the sesame oil, when to use or mix to the procedure? Thanks. Hi Sergio, sorry for that mistake. I corrected the recipe already and thanks for your feedback. Hello. When to use the green chili? Thanks. Hi Isabel, oops I forgot to include it the instructions but I corrected it already. It’s optional anyway. If I use a pressure cooker, should I adjust qty of water or beef broth? Hi Michael, I think you should adjust the amount of water but not sure how much.